Comprehensive Sampling and Sample Preparation is a complete treatment of the theory and methodology of sampling in all physical phases and the theory of sample preparation for all major extraction techniques. It is the perfect starting point for researchers and students to design and implement their experiments and support those experiments with quality-reviewed background information. 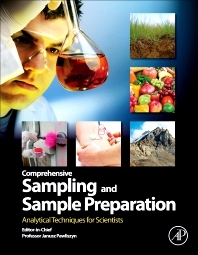 In its four volumes, fundamentals of sampling and sample preparation are reinforced through broad and detailed sections dealing with Biological and Medical, Environmental and Forensic, and Food and Beverage applications. The contributions are organized to reflect the way in which analytical chemists approach a problem. It is intended for a broad audience of analytical chemists, both educators and practitioners of the art and can assist in the preparation of courses as well in the selection of sampling and sample preparation techniques to address the challenges at hand. Above all, it is designed to be helpful in learning more about these topics, as well as to encourage an interest in sampling and sample preparation by outlining the present practice of the technology and by indicating research opportunities. 1.05.6 What Material Should be Used for Sample Lines? 1.18.2 What is Humic and Colloidal Phase? The primary focus of Professor Pawliszyn's research program is the design of highly automated and integrated instrumentation for the isolation of analytes from complex matrices and the subsequent separation, identification and determination of these species. The primary separation tools used by his group are Gas Chromatography, Liquid Chromatography and Capillary Electrophoresis coupled to variety of detections systems, including range of mass spectrometry techniques. Currently his research is focusing on elimination of organic solvents from the sample preparation step to facilitate on-site monitoring and in-vivo analysis. 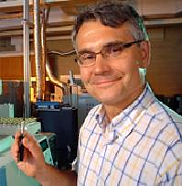 Several alternative techniques to solvent extraction are investigated including use of coated fibers, packed needles, membranes and supercritical fluids. Dr. Pawliszyn is exploring application of the computational and modeling techniques to enhance performance of sample preparation, chromatographic separations and detection. The major area of his interest involves the development and application of imaging detection techniques for microcolumn chromatography, capillary electrophoresis and micro chip separation devices. He is an author of over 400 scientific publications and a book on Solid Phase Microextraction. His Hirsch Index (H-index) is 69. He is a Fellow of Royal Society of Canada and Chemical Institute of Canada, editor of Analytica Chimica Acta, Trends in Analytical Chemistry and a member of the Editorial Board of Journal of Separation Science. He initiated a conference, "ExTech", focusing on new advances in sample preparation and disseminates new scientific developments in the area, which meets every year in different part of the world. He received the 1995 McBryde Medal, the 1996 Tswett Medal, the 1996 Hyphenated Techniques in Chromatography Award, the 1996 Caledon Award, the Jubilee Medal 1998 from the Chromatographic Society, U.K., the 2000 Maxxam Award from Canadian Society for Chemistry, the 2000 Varian Lecture Award from Carleton University, the Alumni Achievement Award for 2000 from Southern Illinois University, the Humboldt Research Award for 2001, 2002 COLACRO Medal, 2003 Canada Research Chair, in 2006 he has been elected to the most cited chemists by ISI, in 2008 he received A.A. Benedetti-Pichler Award from Eastern Analytical Symposium, 2008 Andrzej Waksmundzki Medal from Polish Academy of Sciences, 2008 Manning Principal Award, 2010 Torbern Bergman Medal from the Swedish Chemical Society, 2010 Ontario Premier's Innovation Award, 2010 Marcel Golay Award, 2010 ACS Award in Separation Science and Technology and 2011 PittCon Dal Nogare Award. He presently holds the Canada Research Chair and Natural Sciences and Engineering Research Council of Canada Industrial Research Chair in New Analytical Methods and Technologies. He presently holds the University Professor title, the Canada Research Chair and NSERC Industrial Research Chair in New Analytical Methods and Technologies. His Hirsh Index ("H" Index) is 70.